NEW YORK, NY, USA, September 13, 2018 /EINPresswire.com/ — The singing sustain of multiple razor edged electric guitars, the monster rock backbeat of Jethro Tull drummer Doane Perry and The Moonlight Sonata? 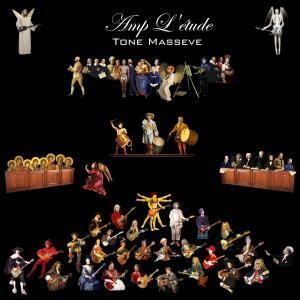 Yes, This mash-up is the concept behind Tone Masseve's album “Amp L'étude.” Classical pieces? Yes, but these are not the dry, conventional versions we've all heard before. The album vividly brings these compositions to life with a new and powerful sound. One of the most powerful elements in his music is the thick, sonorous and clear voice which he elicits from his “Guitorchestra”. Speaking as one who participated in this exciting project, I found the rich harmonic blend and counterpoint combined with the strength and subtlety of his parts, compelling and utterly inspiring to play off of … and was astonished to think so much of this was coming through the head, hands and heart of a single musician. And I never even met him. I don't know how he did it but that is one of the delightful musical riddles which does not need solving.